Professor Mohideen Jameel is a venous surgeon. He qualified as a General Surgeon and developed a special interest in Vascular Surgery. 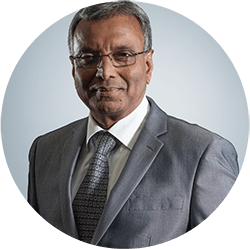 Having qualified in Sri Lanka, he obtained his surgical training in Lancashire and Sussex before joining the Academic Vascular Surgery Department at St. Mary’s Hospital, London and the Imperial College of Science, Technology and Medicine, London. Mohideen Jameel obtained his senior vascular surgical training in Oxford and Nottingham. He worked as a Clinical Lecturer in Vascular Surgery at the John Radcliffe Hospital, Oxford and later as a Lecturer at the Queen’s Medical Centre, Nottingham. Professor Jameel was a Consultant Vascular Surgeon at Kingston, Surrey from 1998 to 2000. From 2001 he was appointed as a Consultant Vascular Surgeon in Wigan and South Lancashire Vascular Network.